Is it just us, or are most store-bought granola bars not that good? Some are waaaay too sweet, and there are others that taste like you are eating a bar of oats and nuts only (well, you kind of are). Most of them have some serious texture problems too. Super crunchy, or fall-apart soft. Yuck. Let us introduce you to these special granola bars. Ok, we lied to you. 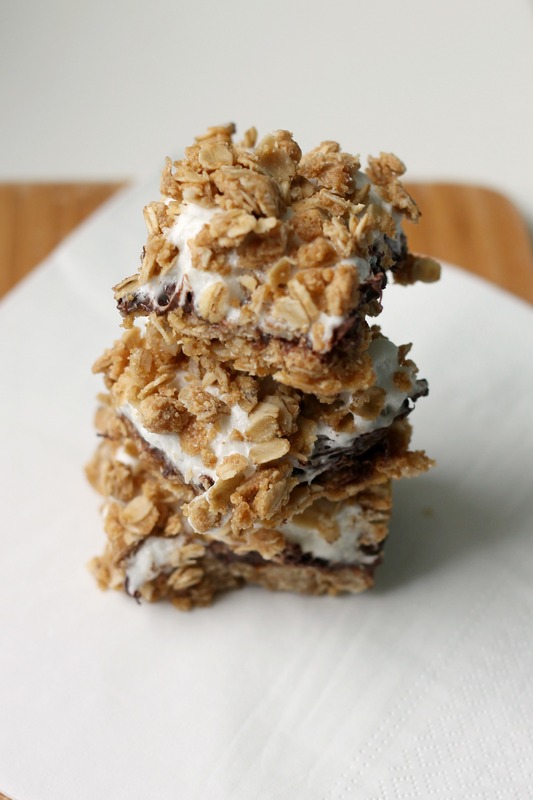 These really aren’t granola bars- they are dessert pretending to be something healthy. That explains why we liked these better than normal granola bars. See, these bars are filled with marshmallows, sugar, chocolate chips, crushed graham crackers, and butter. They have oats as well, so that totally makes them healthy (right?). Here’s how we recommend eating them: cut yourself a big wedge straight out of the oven when they are warm, gooey perfection and enjoy. However, they are still great later too. It’s easier to cut them if they have been frozen first. Wrap them in some waxed paper, and you have got yourself a snack that will trick a lot of people into thinking you are a) really domestic (we aren’t, we promise) or b) super healthy. In a medium saucepan over medium heat, melt the butter. Stir in the sugar and syrup- cook until the sugar has dissolved. Add the oats, flour, salt, and graham cracker crumbs. Press a little more than half of the mixture into a lightly greased 9×9-inch pan. Let cool completely. Meanwhile, preheat the oven to 350 degrees. Sprinkle the chocolate chips over the crust, followed by the marshmallows. Top with the remaining crust mixture. Bake for 15-20 minutes. Let rest for 20 minutes. Put into the freezer for 15 minutes, then cut into squares. Enjoy! Thank you so much! We love them :).